← TweetAdder 3.0 – Not for the Birds! This entry was posted in General Info and tagged dinar, invest, Iraq, Re-Value, RV. Bookmark the permalink. 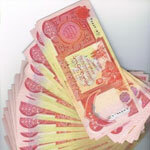 this is very exciting to here of the New Iraq Dinar becoming more and more promising. What happens if they RE-Domninate (take three zeroes off, as proposed)? Iraqi dinar bill at 25000 becomes 25 dinar. Does the 25000 bill need to be redeemed at a bank for a 25 dinar bill?